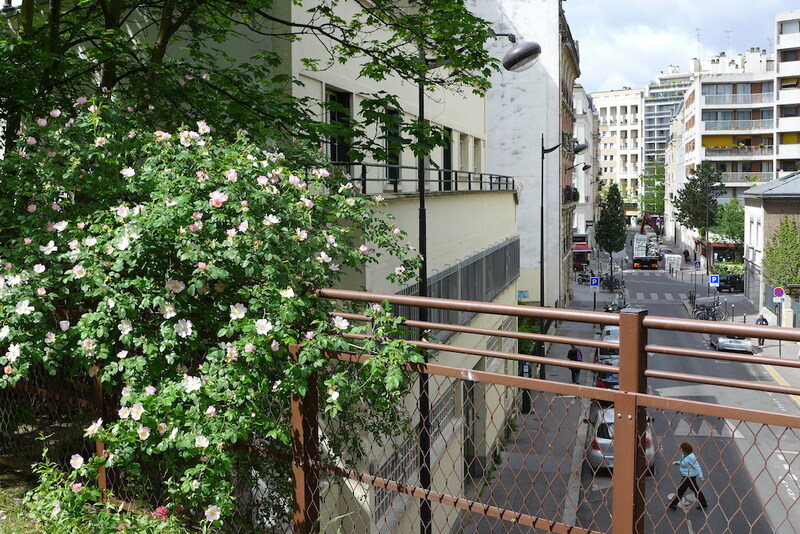 This pedestrian-friendly path runs most of the time above or under the street level through the 12th arrondissement of Paris. 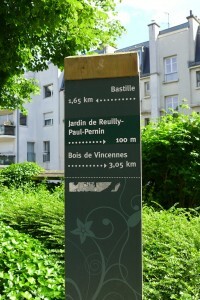 It starts behind the Opéra Bastille at the crossroads between the Rue de Lyon and the Avenue Daumesnil and ends at the entrance of the Bois de Vincennes. 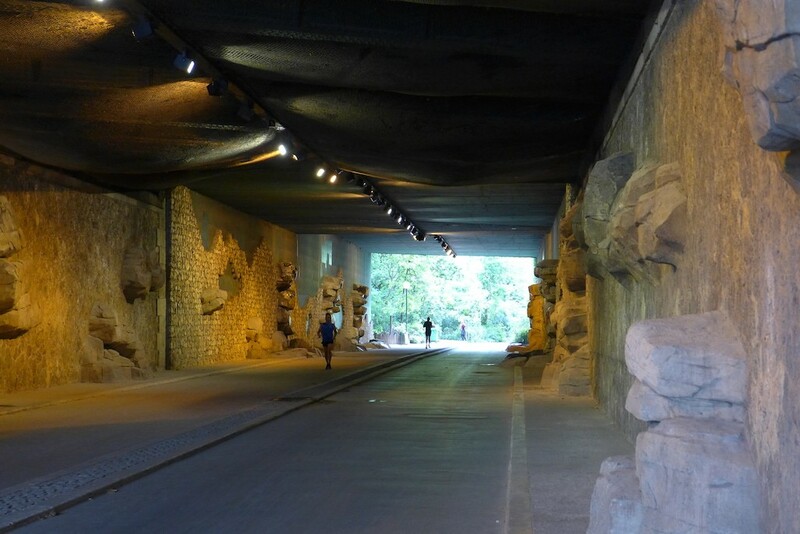 Several accesses have been built along the path so that one can have a walk on it in whole or in part. 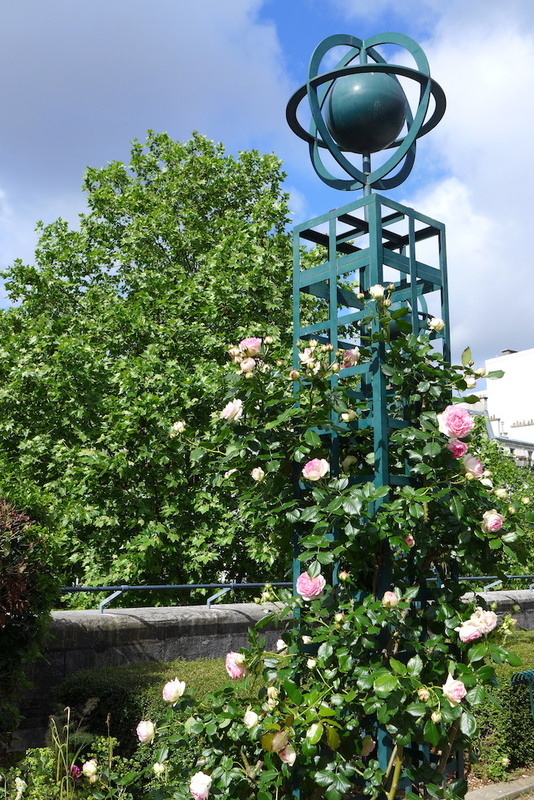 I went for the whole walk from the Bastille to the Jardin Charles Péguy: it takes less than one hour and a half and is really worth it! 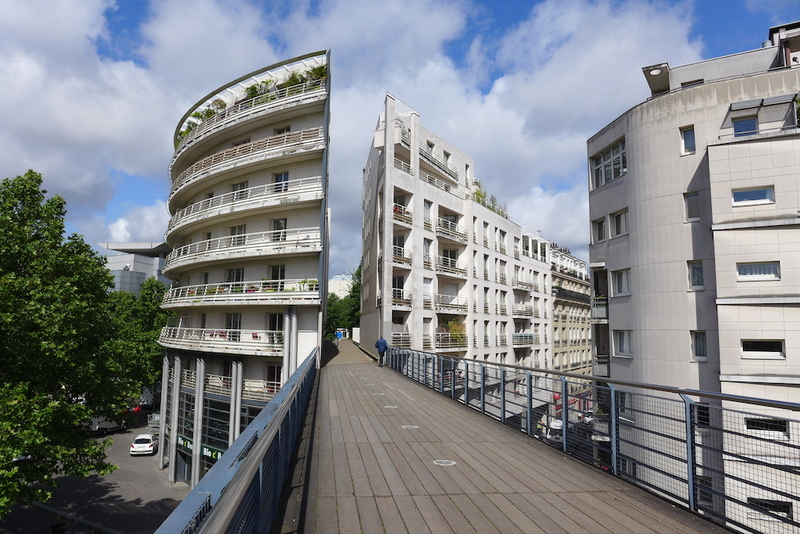 The unusual views on the city and its buildings that one can see while walking on the Viaduc des Arts, ten meters above the street level, are unique! 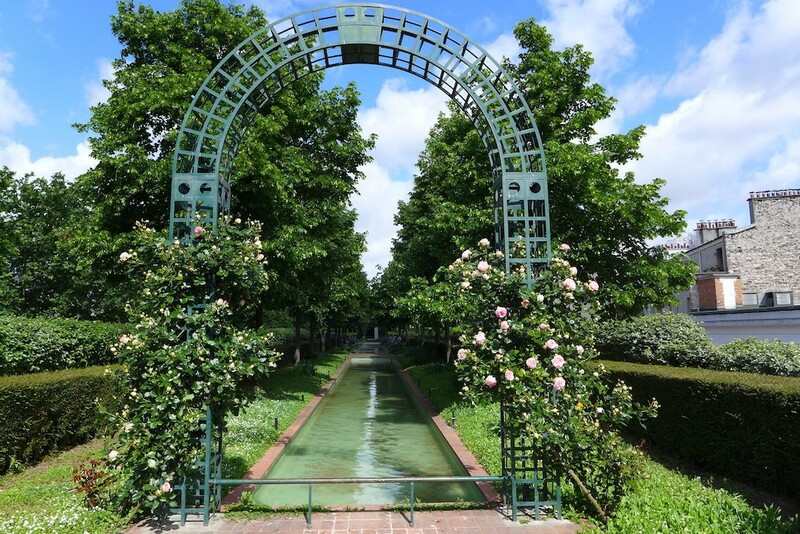 So are the freshness and the quietness of this space: one can enjoy the smell of the flowers (many rosebushes at that time of the year), the song of the birds… and forget for a while the bubbling city yet so close. 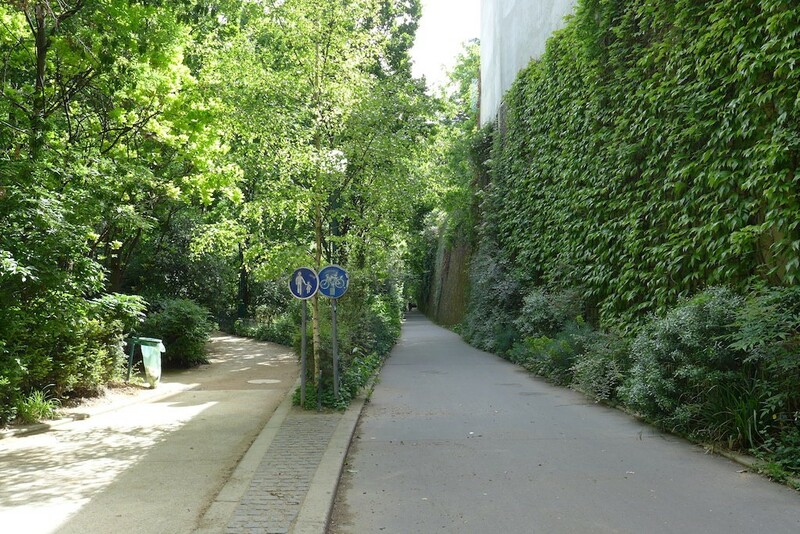 I really recommend to go for this walk on a weekday: you will only bump into few pedestrians and some joggers while the weekends are much more crowded. 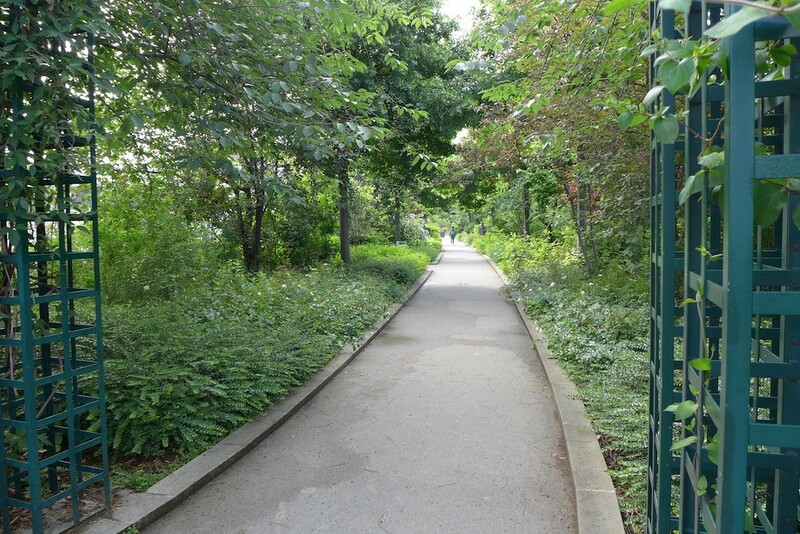 Let’s start our green walk! 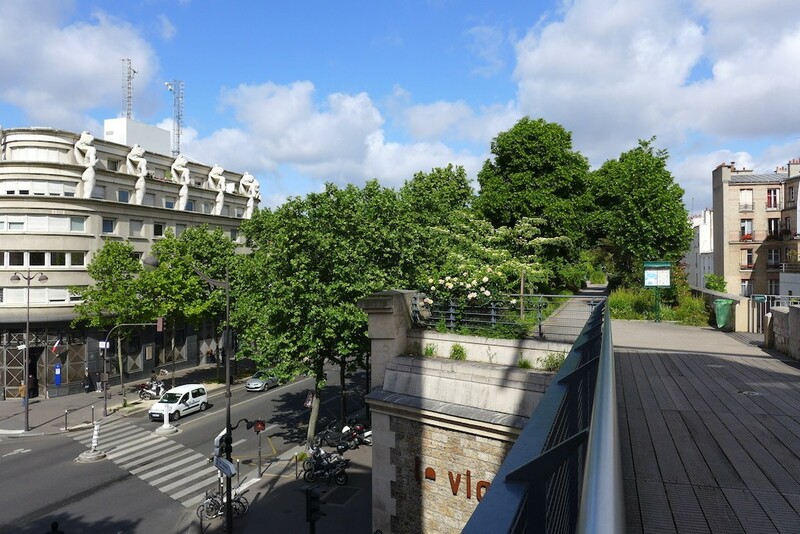 I started my walk Place de la Bastille and walked along the Opéra on its right side in the rue de Lyon towards the crossroads with the Avenue Daumesnil. 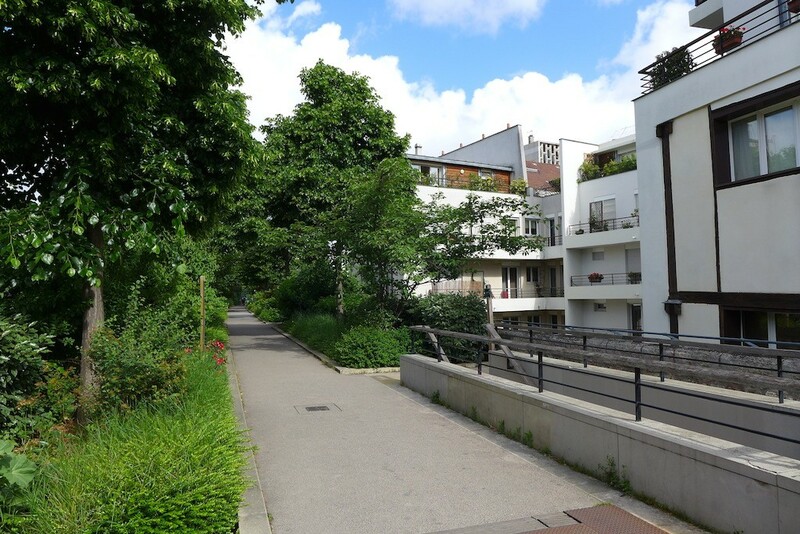 There, on the left side, a flight of stairs permits to climb onto the Viaduc des Arts at the entrance of the Promenade Plantée. Here and there the views on the city and its buildings are amazing! 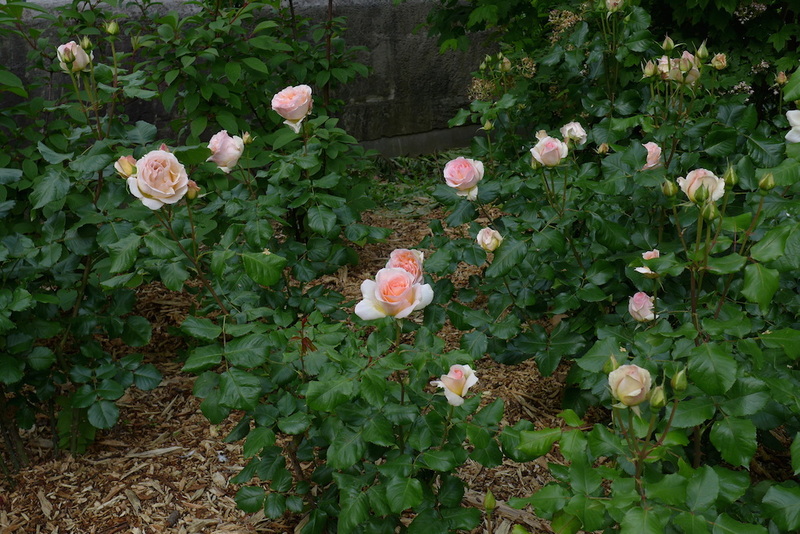 There are flowers-mainly rosebushes at that time of the year- all along the path! 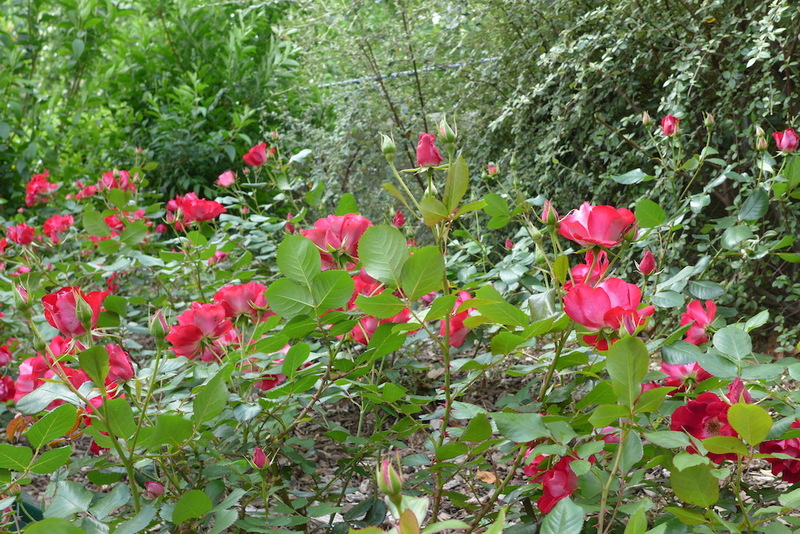 The freshness of the air is emphasized by the presence of water. 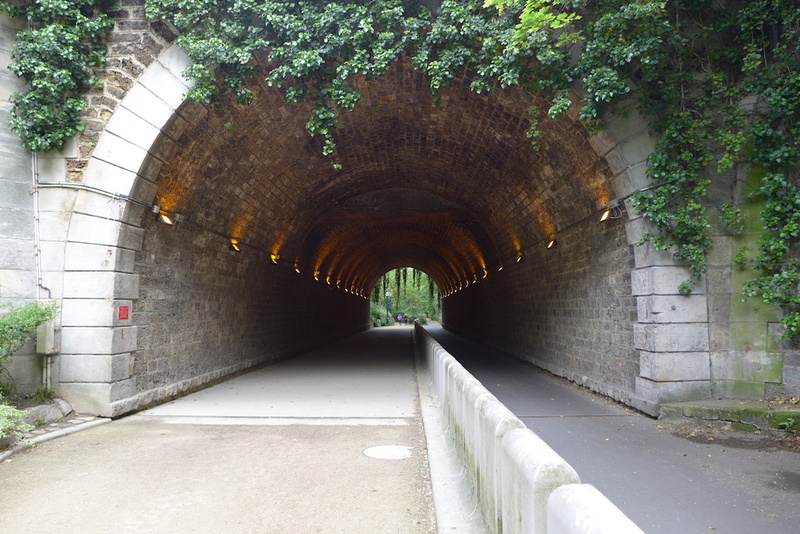 After walking less than half an hour, stopping from time to time to take pictures, I got to the end of the Viaduc des Arts. There the path becomes wider and the city seems closer. 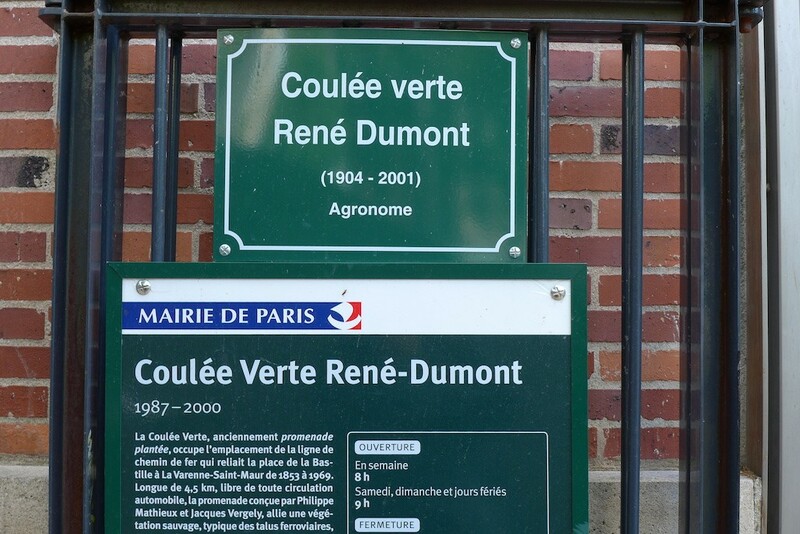 One has reached the Jardin de Reuilly which lies at the street level at the crossroads between the Avenue Daumesnil and the Rue de Charenton and offers a beautiful vast lawn. 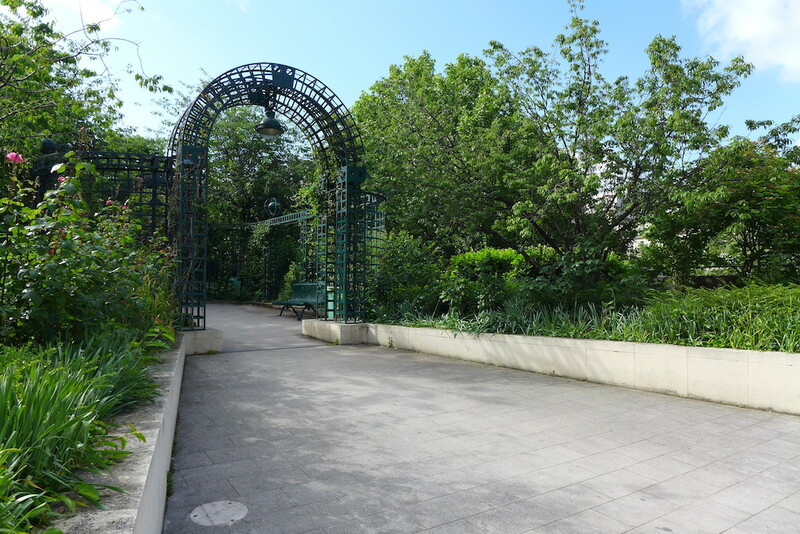 The Promenade Plantée continues above the Jardin de Reuilly: the Passerelle de Reuilly permits to get over the lawn. This cable-stayed footbridge was built in 1992 and is really very aesthetic. 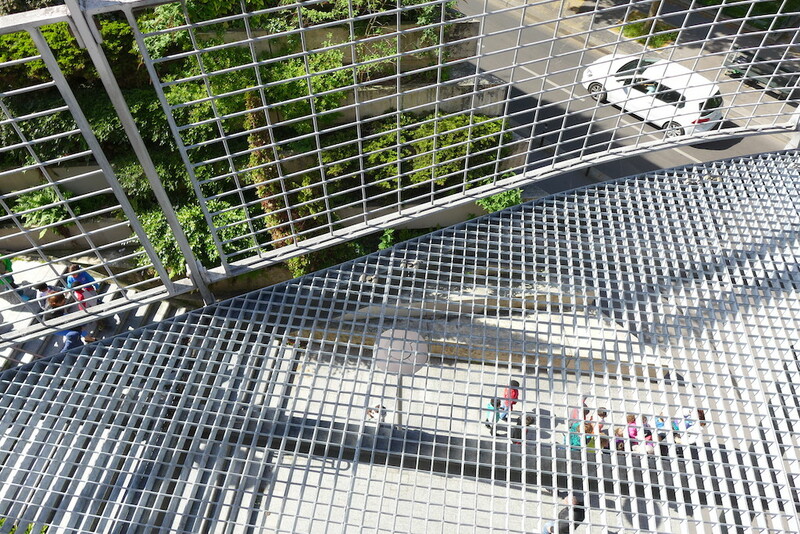 And do not be surprised or seasick: the footbridge moves up and down with the strides of the joggers! 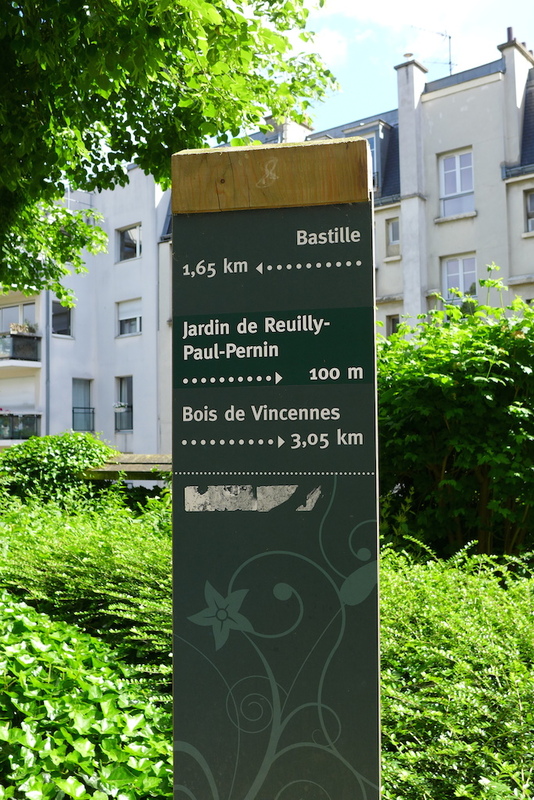 The Jardin de Reuilly down there is the third largest green space in 12th arrondissement of Paris right behind the Bois de Vincennes and the Parc de Bercy. 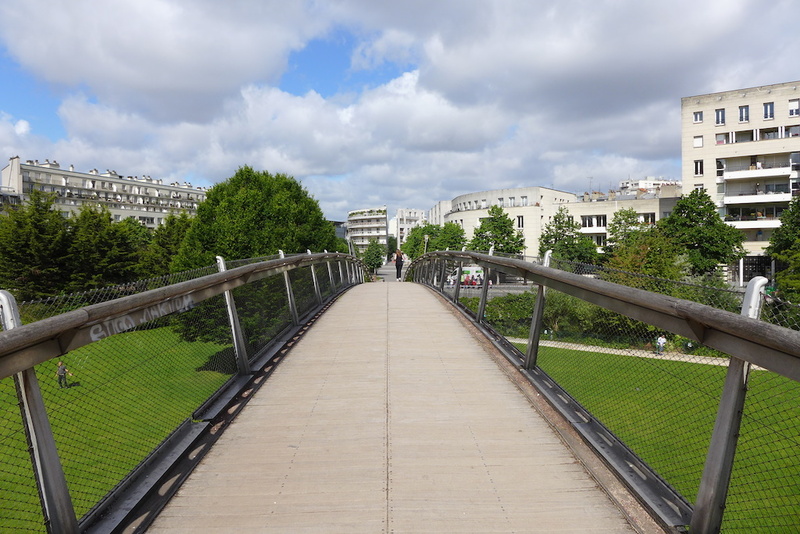 At the end of the footbridge the Promenade plantée continues through the city and is now open to bicycles as well offering two different paths, one for pedestrians and one for cyclists. 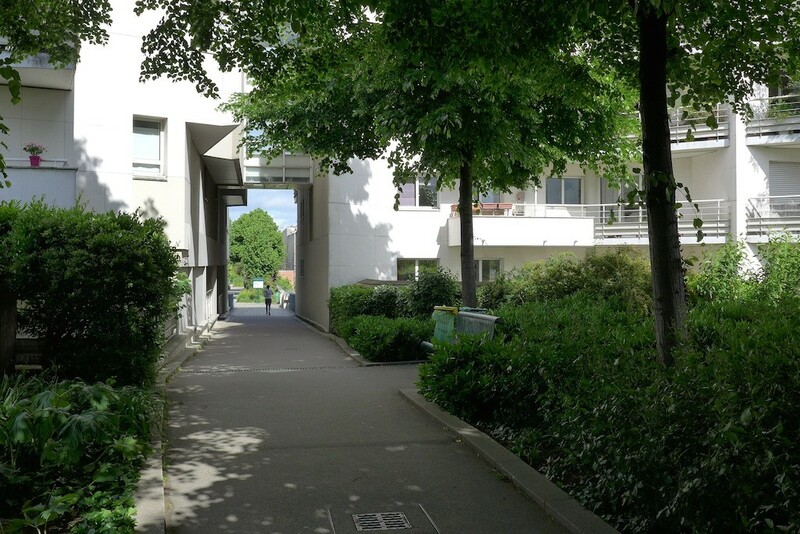 The Allée Vivaldi is a wide street lined by harmonious white modern buildings. 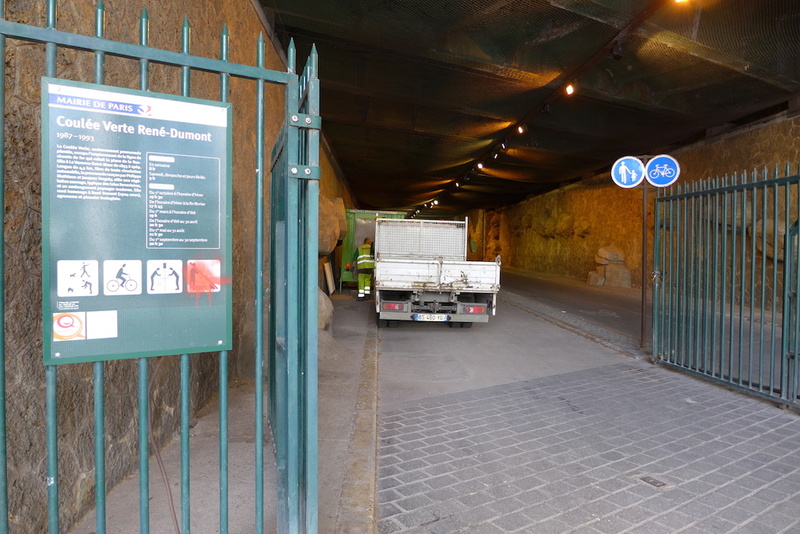 Entrance of the Coulée Verte – Tunnel de Reuilly – Not very appealing! 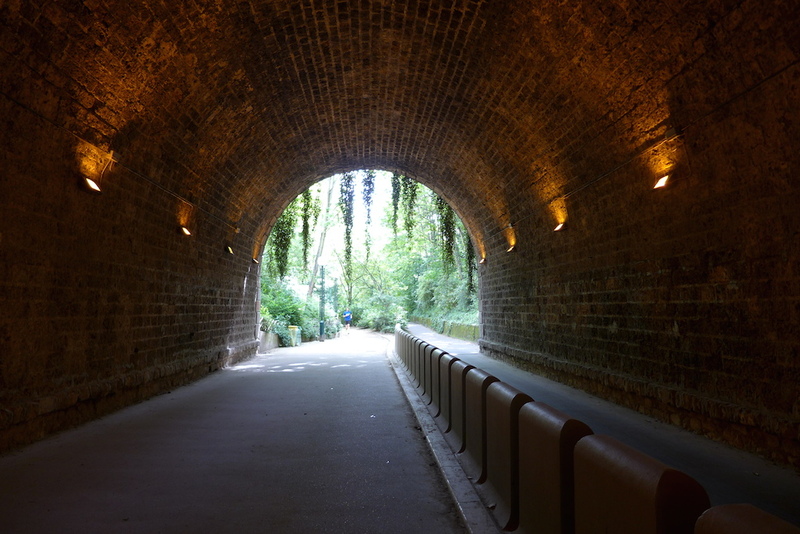 … and brightly lit and rather green tunnels! 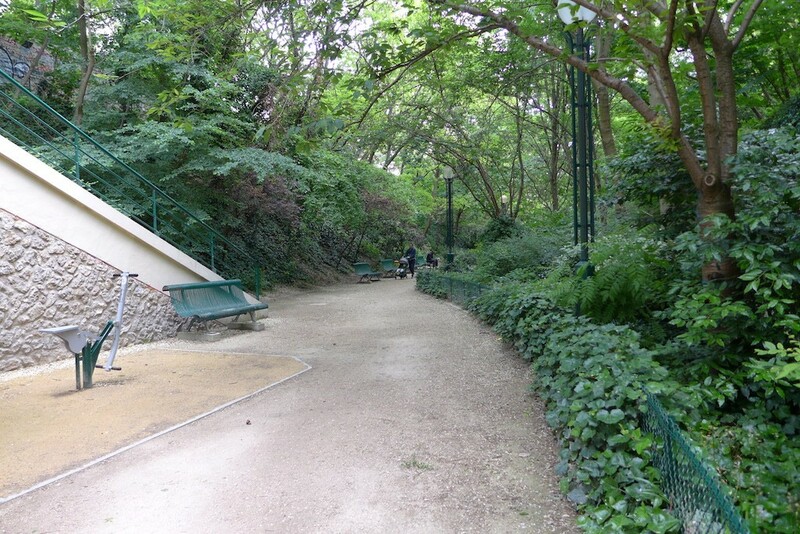 There is even a fitness trail! 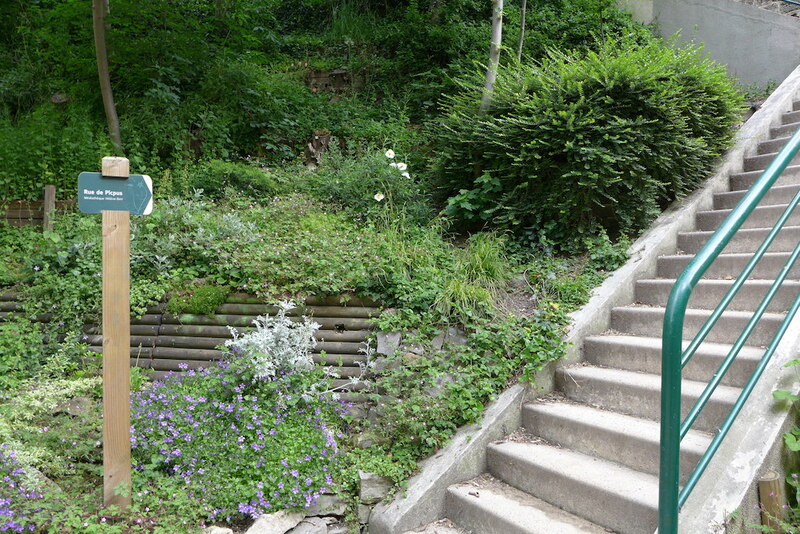 Le Jardin Charles Péguy: civilization again! 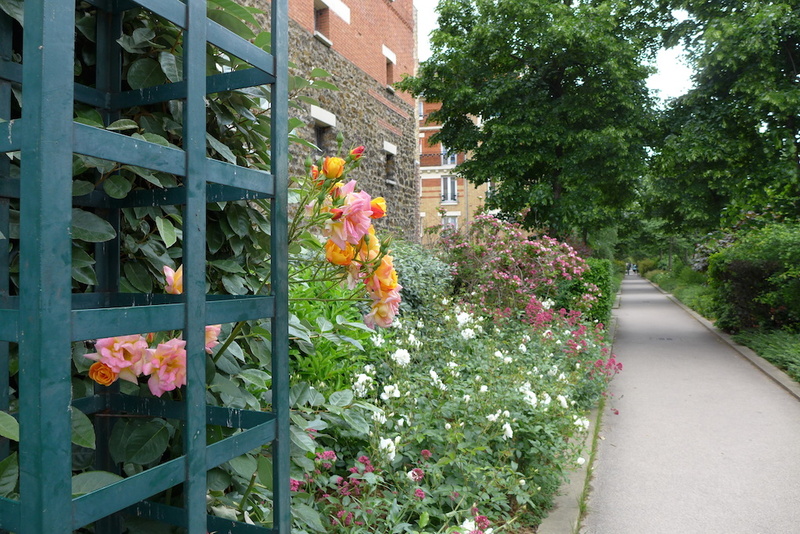 The path leads into the Rue du Sahel… back to earth and to the city life. 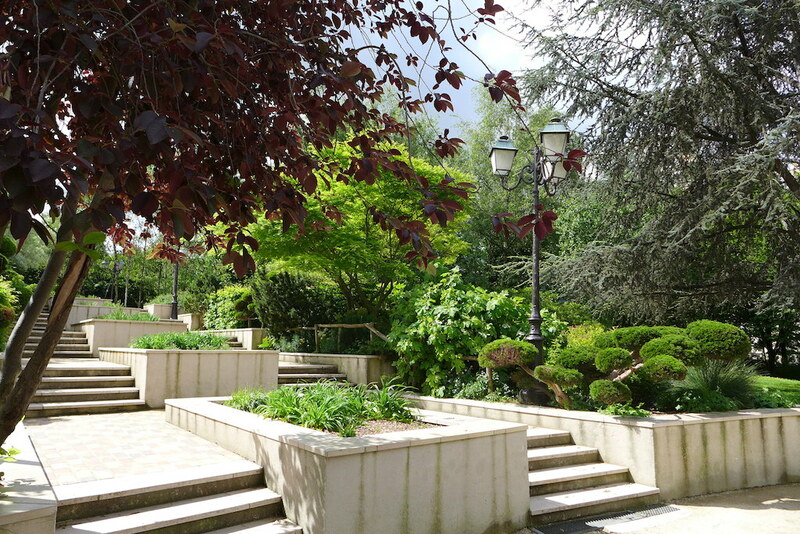 At the end of this street a flight of stairs permits to continue the walk on the Promenade plantée and to reach the Jardin Charles Péguy: a pleasant garden where to have a rest fitted out with many areas for kids and offering beautiful trees and plants. 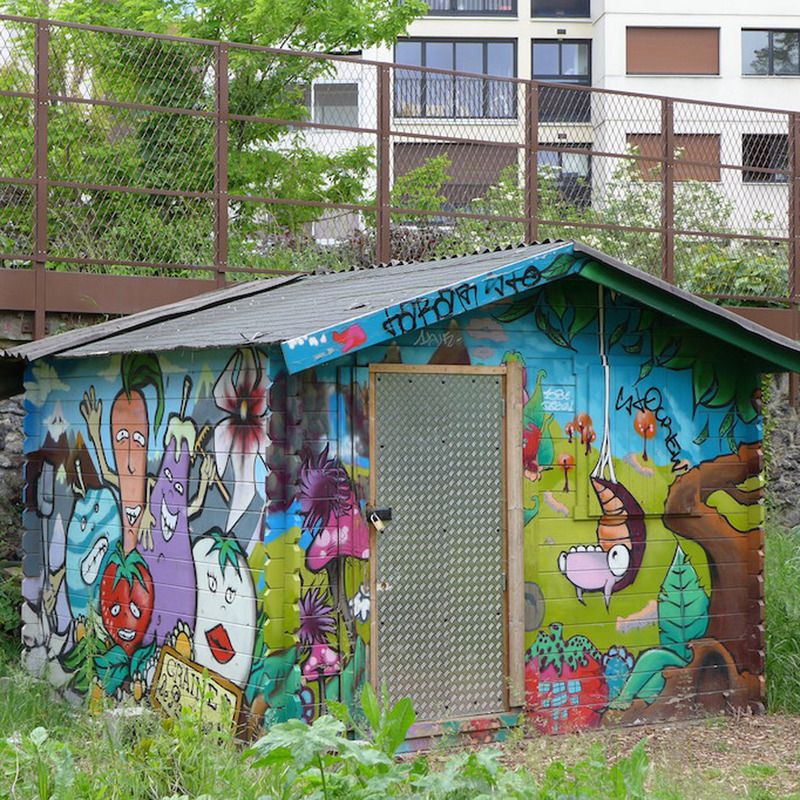 La Petite Ceinture: A pleasant way to end the walk! 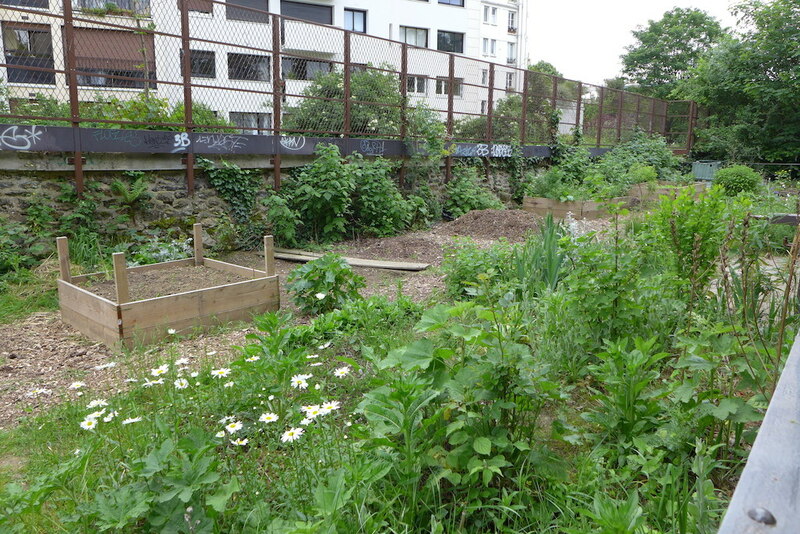 At the other end of the Jardin Charles Peguy (behind the table-tennis tables) a path continues to the ‘Petite Ceinture’ which is a quiet space given back to nature where one can find a community garden and a nature trail. 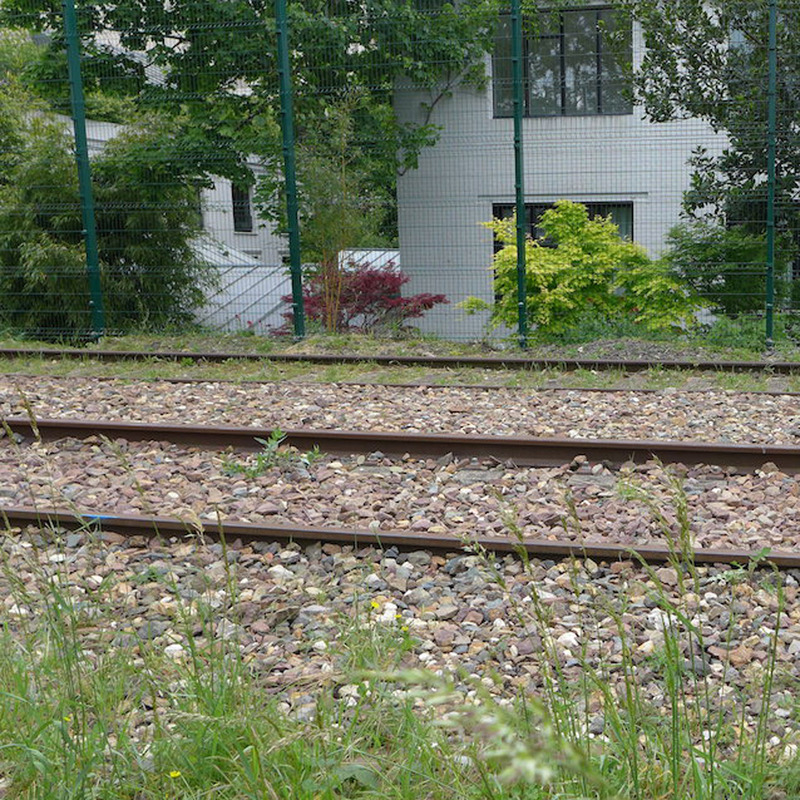 And not to be missed: the views on the unused railway, whose name was: ‘la Petite Ceinture’ as it used to go around Paris as a belt. 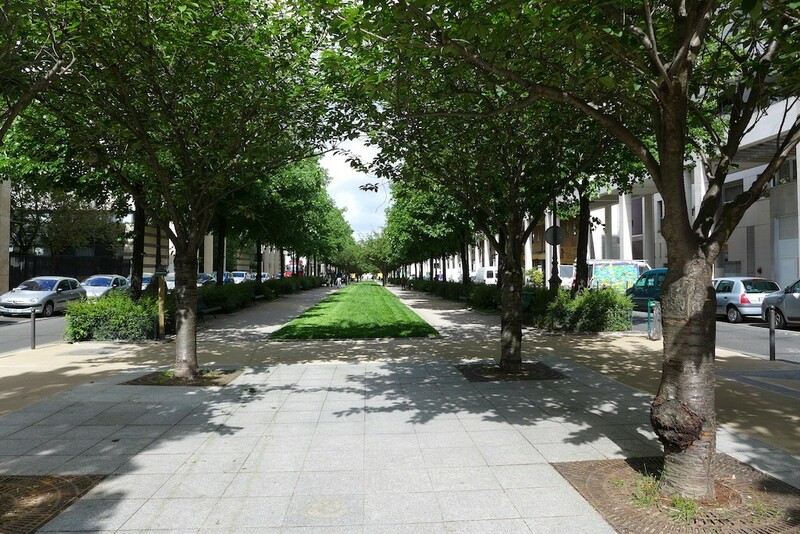 It is now a green corridor for many species between the city and its outside. 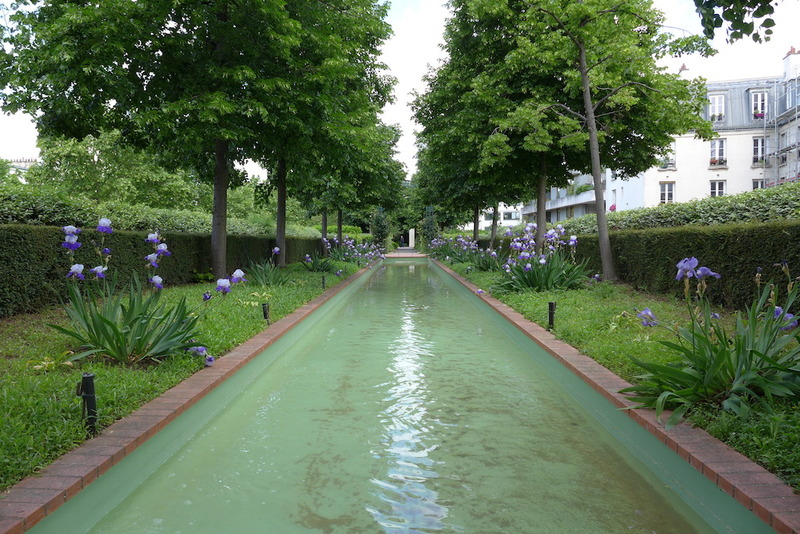 Green and unusual, just like our whole walk: a very pleasant way to end it! Very nice pictures ! 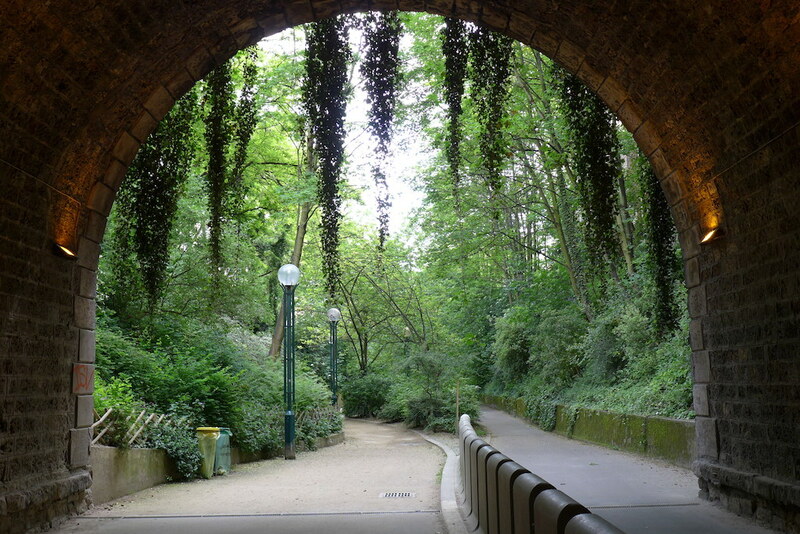 I walked there a few years ago ; I’ll do it again very soon. 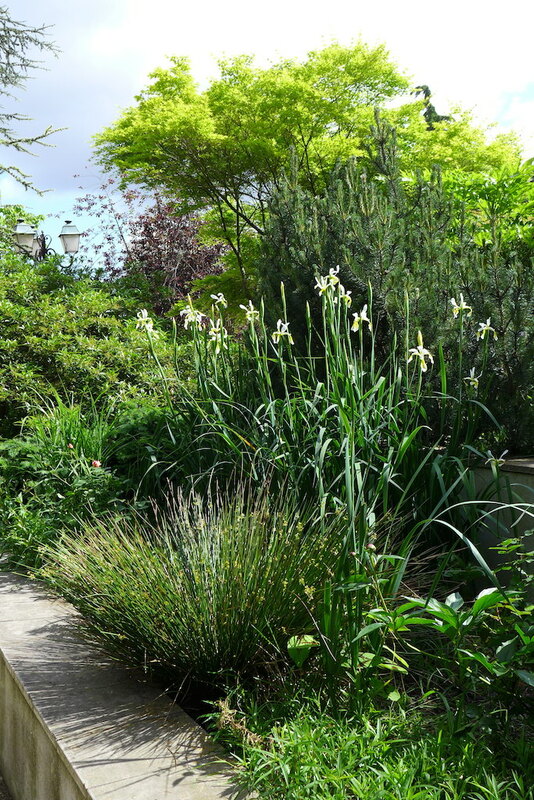 Brilliant – thank you for your comprehensive post! I was searching for something like this, as I wanted to know how we could find it. Can’t wait to go there in a few months’ time! Thank you Louise. I hope you’ll enjoy the walk. when are you coming ? Thank you, Christine, for that enjoyable and informative article! 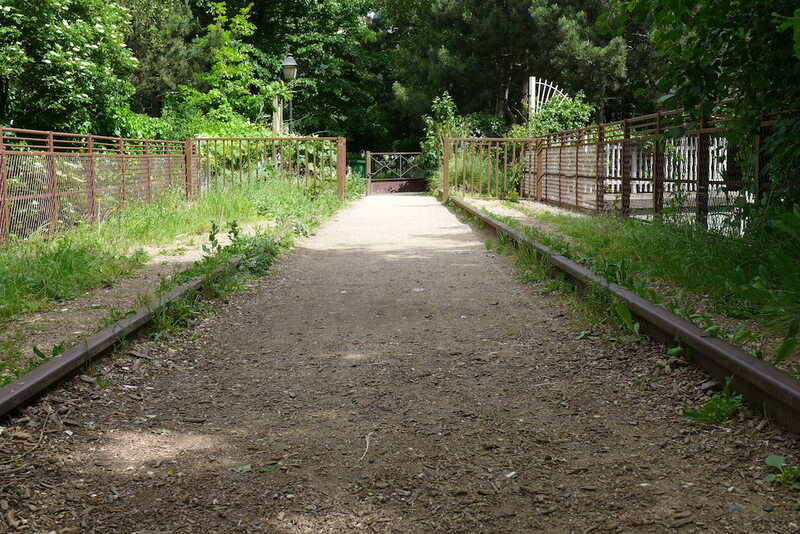 When the walk ends at ‘Petite Ceinture’, where is the closest Metro to there? 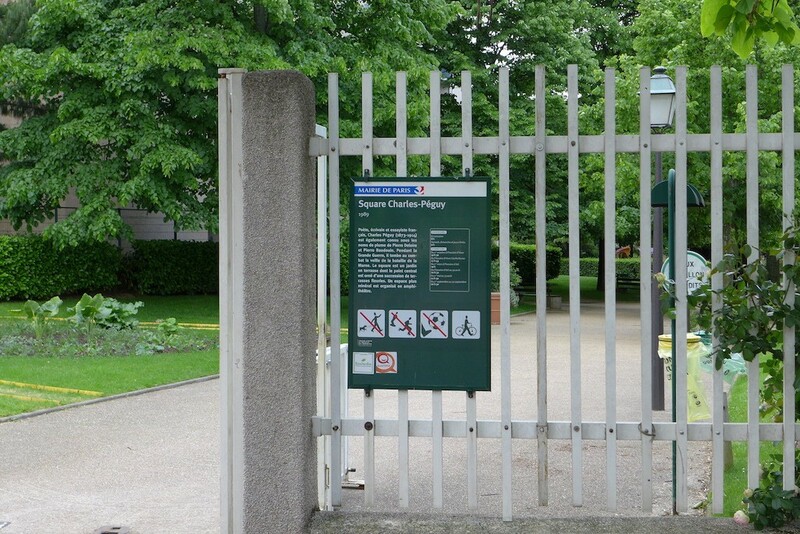 Also, if we bail at an earlier part of the walk, what is a good exit point close to a metro? Dear Steven, sorry for not answering earlier, I hope it is not too late ! 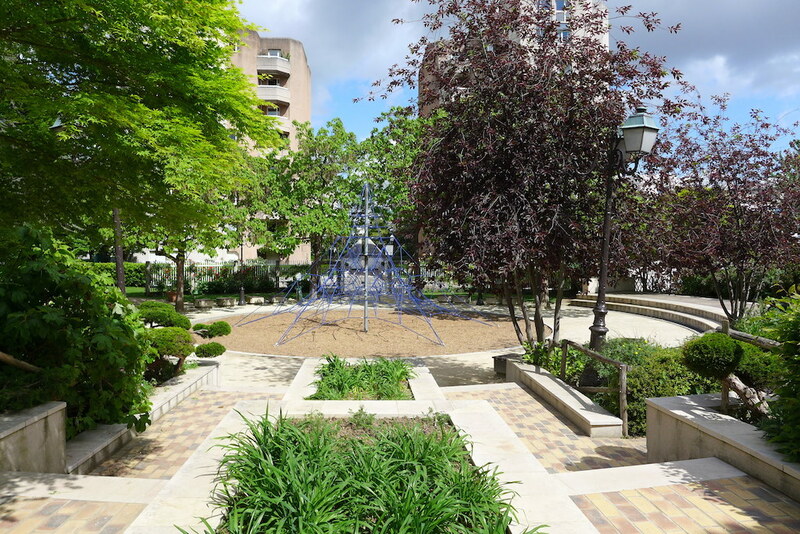 You can get ot either at Square Charles Peguy and the closest metro station is Michel Bizot (metro line 8) or at the rue du Sahel and the closest metro station there is Bel Air (line 6). On both cases the metro is about 5 minutes walk. 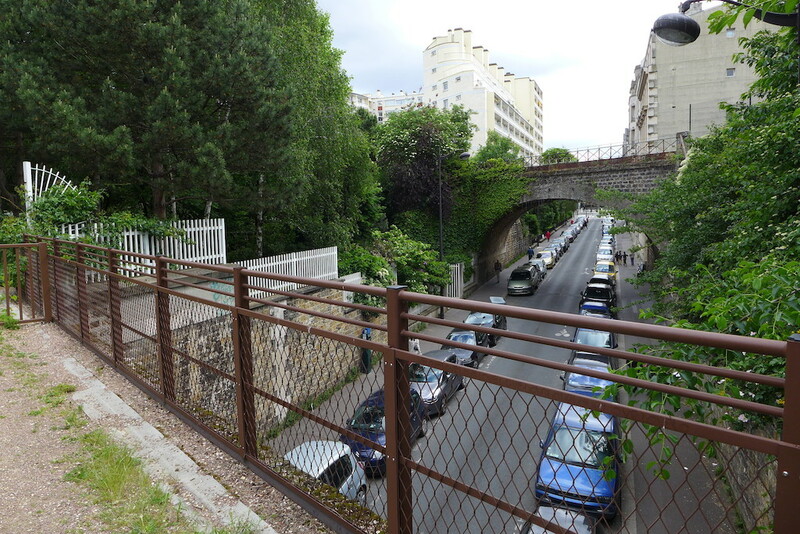 When you arrive at the Petite Ceinture there is no exit and you have to turn back for a short walk before getting to the Square Charles Peguy ! 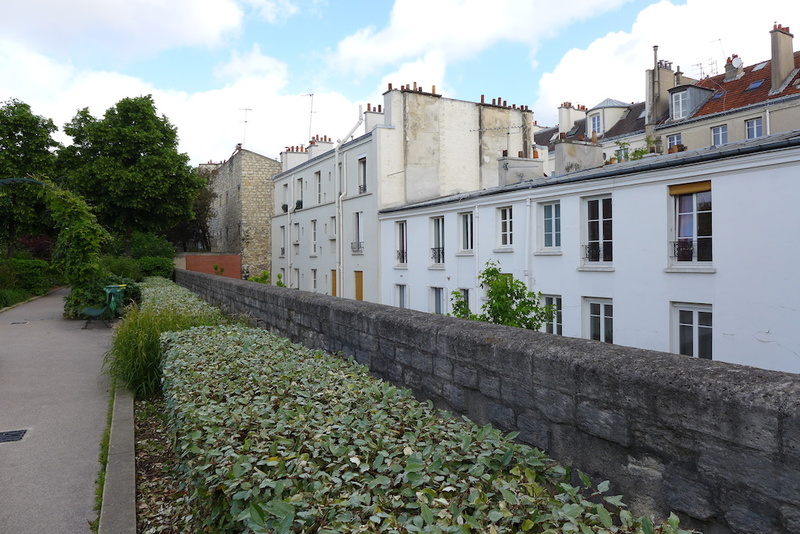 My Parisian friend Gabrielle took me on the elevated portion in 2016. 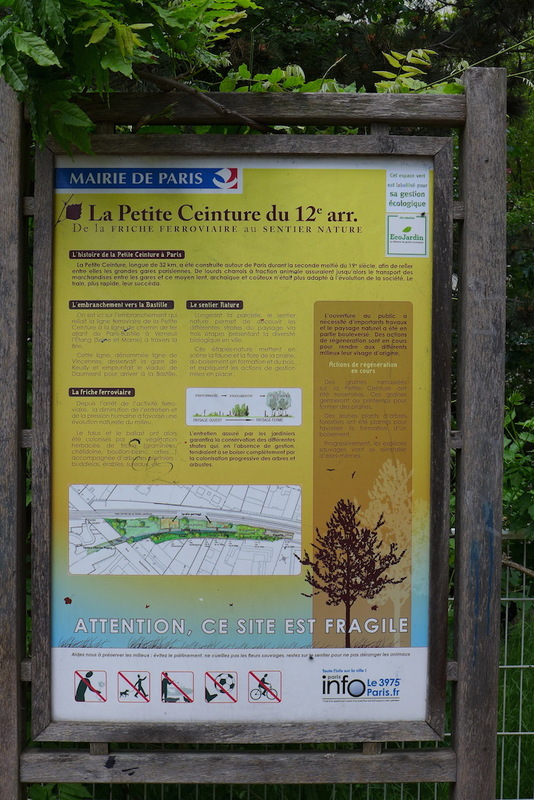 It is beautiful, interesting, and superior use of an abandoned railbed….Imagine all this peace and quiet, flowers and birds too, right in Paris. I am returning w friends who have not seen it and will enjoy introducing them. Thank you for a very compromising article. Many thanks for both your description and photos. So helpful! One question I have is whether at the end of the walk we can continue on to the Chateaux Vincennes? We hoped to visit the castle afterward. 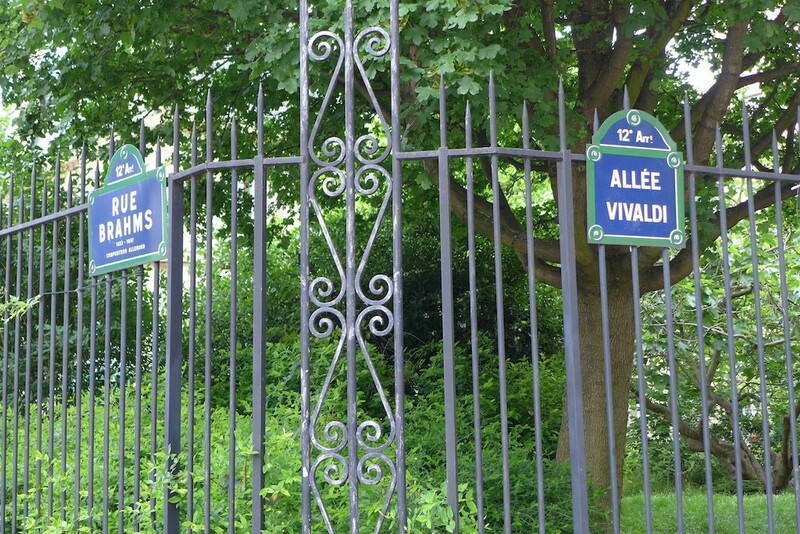 Can we enter to Bois Vincennes at the end of our walk along Promenade Plantees and then walk to the Chateaux? Might you know how long it might take? Thanks! 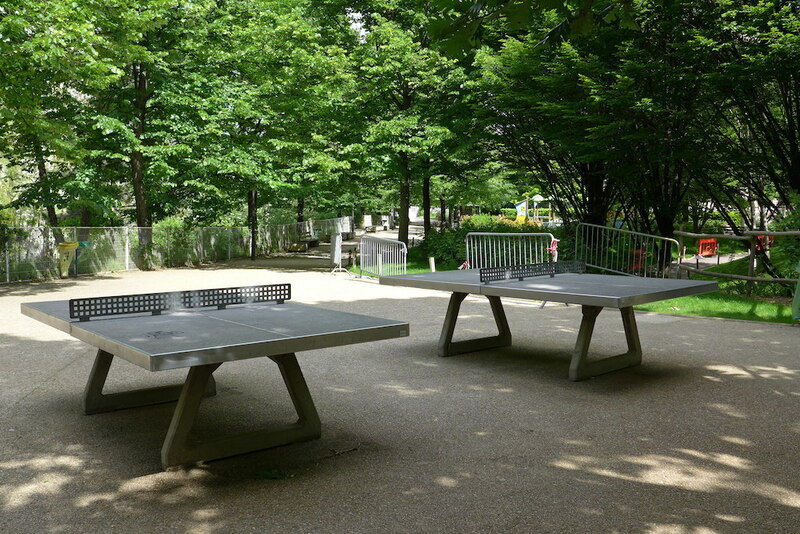 Next Next post: Experience the Unique Atmosphere of Roland-Garros!